This easy sipping beer found favor in my eyes after cutting the grass one warm afternoon. I was looking for a beer that had flavor yet was simple enough to just be a thirst quencher. 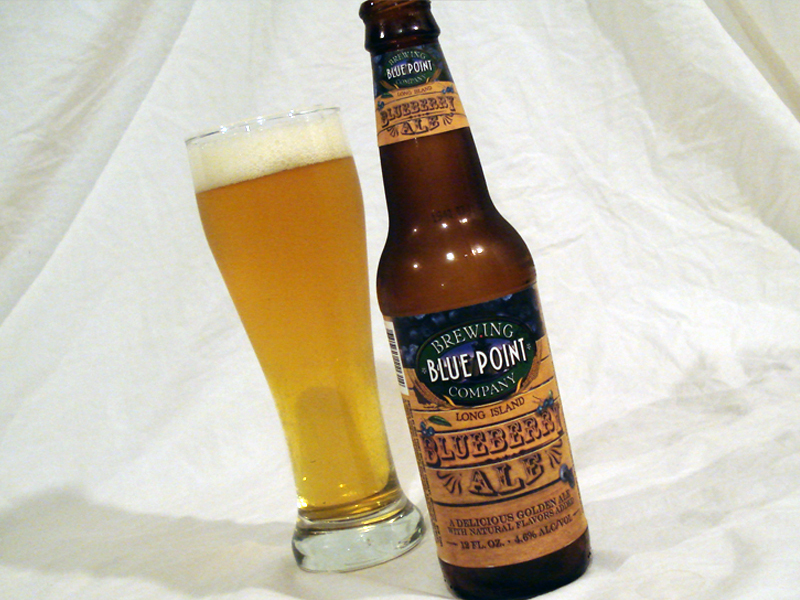 Having sampled a few of Blue Point’s beers already I knew this was going to be an above average beer. I’ll admit sometimes fruit in beer can be a little overwhelming (i.e., Wild Blue which is more puree than beer), but when done right like Sweetwater Blue the beer can really come alive. A rather old time looking label that depicted a crate of blueberries gave me mixed feelings. Breaking the seal proved to be a spritz of blueberry aroma that was noticeable a few feet away. The carbonation was lively and produced a decent white head that faded quickly. While taking the picture I was reminded of when my mother use to bake blueberry muffins except this time it was not a warm bready quality. Instead, there was a cold refreshingly crisp aspect to it. That about sums up the aroma…a blueberry muffin. Judging by the appearance this beer was not going to be a blueberry bomb as it resembled Blonde Ale or Pilsner. So, raising the glass I took a swig. Not bad, not bad a all. The fruit component is not over-the-top while remaining the focus. Light malts allowed the fruit to express itself yet gave some body. The cool blueberry flavors were gracefully present throughout each sip. Up front it was more of a cranberry/blueberry tartness if ever so mild. When it come to the finish the flavors were mellow. I’d say this was a good example of how to incorporate fruit into a beer and would rank it up there with Sweetwater Blue as far as blueberry beers go.